.... and on top of all, there is a giant walk-in Christmas tree! Tanglin Mall - Orchard Road - Singapore Flyer: Find out why you should visit these three locations in Singapore this December. Millions of small LED lights are switched on and brighten the sky at Singapore Flyer. Giant ornaments in the form of doves and hearts hang from the trees along Orchard Road. The floor-to-ceiling windows are polished and the shops have arranged their new collections and promotions. Everything is ready and waiting for some 6.57 Million visitors. Hurray, it’s the festive season again! Christmas in Singapore always starts early, right after Deepavali. This year, the street decorations were switched on at the 16th of November. 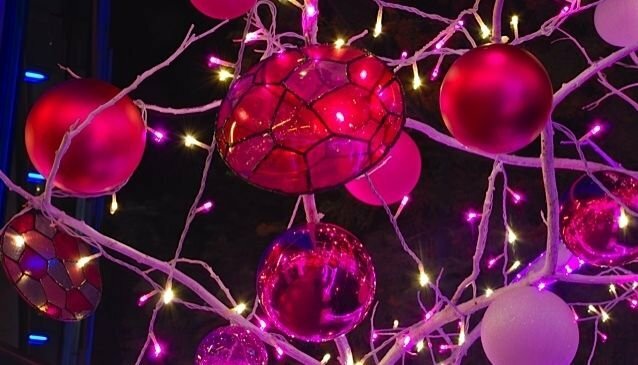 Here we show you the three best places to discover this Christmas season in Singapore, and admire the colourful Christmas decorations that Singapore is known for all around the world. This expat-oriented shopping mall may be among the smallest, yet it’s big when it comes to Christmas. Not only do they have one of the most charming decorations this year with a huge sledge, fairytale reindeers and little elves, they also make children jump with happiness like no other mall in Singapore due to their daily “snow"-events. In the evenings, a soft and white flurry made out of foam is used to transform the place at the entrance of the mall into a white wonderland. The folklore-inspired theme of Orchard Road brings nutcrackers soldiers, toy trains and snowflakes. Giant ornaments hang from the trees, together with 3 metre long strings of Christmas baubles. The 2.2 km long shopping road is set to open up the hearts of its visitors with traditional colours and old-fashioned motifs. It’s all about the three key elements of Christmas: red hearts are for love, doves stand for peace and the green trees symbolize joy. The aim is to make you feel at home and to relive memories of childhood Christmas, all while walking through the highly urbanised city. There is much to do along Orchard Road this Christmas season: gift shops offer limited-edition souvenirs featuring this year’s Christmas motifs, live musical shows bring you Christmas carols, dances and puppetry and on top of all there is a giant walk-in Christmas tree! To complete your journey, have a look at Singapore’s tallest Christmas tree at the Singapore Flyer. The over 2 million LED lights used for the tree and Santa sleigh across the giant wheel are quite impressive. On the ground, wander around the Christmas Village featuring a 21 metre Santa and his sleigh, a 10 metre Christmas tree and a real European Christmas market. Kids will be happy to explore Santa’s home, join the Christmas workshop and other activities such as the pie-eating contest. We hope you enjoy Christmas in our tropical city, for sure there is something for everyone and we wish you a delightful time. The snow event at Tanglin Mall is free of charge and starts every evening at 7.30pm. On weekends and public holidays there is a second avalanche at 8.30pm. Make sure you bring a second set of clothes along for the snow event at Tanglin Mall. We know the little ones will be wet from top to toe afterwards! Shops along Orchard Road are usually open until 10pm or even later on weekends during the festive season. Plan to take public transport, as the queues at taxi stands will be long, especially during the evening. The admission ticket for the Christmas Village at the Singapore Flyer is SGD 8 for children and SGD 12 for adults during peak times. Off peak tickets have 50% off. The Christmas Village and Market at the Singapore Flyer are open daily from 12.30 to 9pm.